The Four Bridges at Lake Fork drummed up enough business to support the Rainbow Hotel not far off of U.S. 50 in Gunnison County, Colo., in the early 20th century. In fact, there were a few hotels in the area, as people of all types and from all different places came to admire the “new” U.S. 50 bridge, the Rainbow Bridge, the Lake Fork Railroad Bridge and a tall but short steel truss bridge crossing the Lake Fork of the Gunnison. They formed an impressive, tight knit group of spans, with three situated deep down in a canyon. The new U.S. 50 bridge, when it opened in 1924, was the highest public span in the U.S. at 185 ft high. Perhaps it was a convenient oasis for those traveling east or west, and today one can only imagine the visual beauty of infrastructure intertwined with the great Earth. Pictures are now all that remain of the sight, which presently rests 300 ft underwater after a reservoir was filled in the 1960s. Three of the bridges were removed prior to the flooding, while the fourth, the new U.S. 50 bridge, was left alone. It became a mystery as to what happened to the one-time record-holding span. A common story was the lake rose to the level of the bridge, froze in the winter and the ice lifted the bridge off its moorings, and it fell into the canyon of Lake Fork. It was not until recently that the real truth was uncovered. Using GPS and sonar equipment, the new U.S. 50 bridge was found still intact. All the hotels and tourist destinations are long forgotten, but the road most travelled, U.S. 50, is still there in full operation for all to see, and for the Colorado Department of Transportation (CDOT) to maintain. In May 2017 crews began work on a 12.1-mile segment of U.S. 50, and even though the bridges are gone the area is still one of Mother Nature’s finest pieces of work, which means the environmental constraints were as strict as they have ever been. CDOT, like many states, also has to follow a strict budget. When it came time to decide on what to do with this stretch of U.S. 50, the top choice was cold in-place recycling (CIR). The project cost just over $9 million, and CDOT saved $700,000 by going with CIR. Complicating matters was U.S. 50’s role in transportation in the area. Truckers use it to bypass I-70, and since the last resurfacing about 15 years ago the road was marred by alligator and longitudinal cracking. Just like those bygone bridges, CDOT and prime contractor A & S Construction, along with subcontractors Coughlin and Co. and Midstate Reclamation and Trucking, effectively and efficiently knocked out all of the unwanted challenges to claim the 2018 Roads & Bridges/Asphalt Recycling and Reclaiming Association Recycling Award in the CIR category. The U.S. 50 project was complicated by the corridor’s function as a major trucking bypass to I-70. Consequently, traffic control was a daily issue during active reclamation and paving, as shown here. Virgin materials were used when this stretch of U.S. 50, a two-lane road with 10-ft shoulders, was resurfaced 15 years ago, so when cores were evaluated leading up to the CIR project it was determined that the existing pavement was an ideal candidate for recycling. A Roadtec milling machine came in and took off 4 in. of existing pavement. It took a total of four passes to cover both lanes and shoulders. However, there was a section of roadway where there were 40-ft-wide lanes and 10-ft shoulders, which meant 4 ft had to be reprocessed and remilled. The CIR remixing machine picked up the windrowed asphalt and mixed 1¼-in. aggregate with 1.5% hydrated lime and 2% recycled oil, but with the wider passing lanes the blending was getting a bit misconstrued. The recycled layer was used for the base course, which varied in depth from 5 to 9 in. Areas that required thicker sections were due to past landslides, and CDOT maintenance crews came in and added more material. Bomag vibratory rollers came in and handled compaction in just three passes, and some of the densities were over 100%. “It is that good of material when it comes out of the machine, the lime heats it up and anytime you have heat you are able to get it down tighter,” commented Gray. Next came the 2-in.-thick surface mix, which was produced from a Gencor asphalt plant about 10 miles from the work site. A PG 75 SX asphalt binder was used, aggregate size was 1.5 in., and temperature at laydown was 275-300°F. A Roadtec paver handled laydown duties, and a Bomag vibratory roller and Caterpillar and Hamm pneumatic tire rollers worked together to hit a 94% density in just five passes. A quarter-mile test section that used fiberglass in the asphalt mix also was put down. A Troxler nuclear gauge was used to check for density, and A & S Construction had an experienced construction worker taking random reads; if he found a spot that was unacceptable he would put a pin in the pavement. The contractor also made sure the center joint in the pavement was treated properly. A special wheel roller welded to the paver compacting at an angle did the trick. A profilograph and 10-ft-long level was used to check for smoothness. Five spots had to be regrinded, but the contractor did receive $126,000 in smoothness bonus. 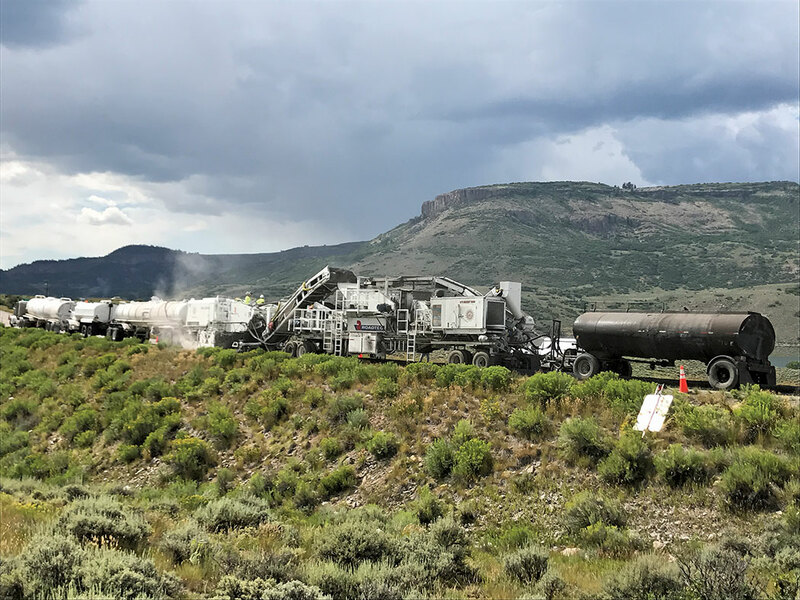 U.S. 50 lies in one of the most environmentally sensitive areas in the state, and special precautions were taken to protect the threatened Gunnison Sage Grouse breeding grounds along the corridor. Paving hours were limited to 10 a.m. to 4 p.m. Staging of the CIR lime and recycled oil also was a critical issue because no spills were allowed due to the reservoir and endangered habitats.